Meet Convener (Hike Leader): Chris Leggatt – celebrating 30 years of MCSA membership. 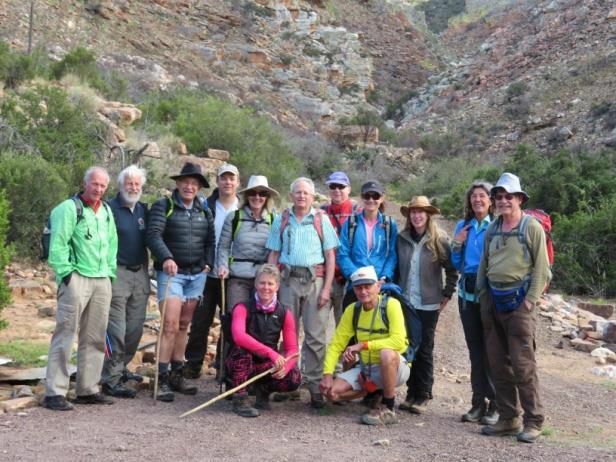 Members: Chris Leggatt, Fred and Nicky van Berkel, Dave and Fay Jones, Maretha Alant, Ed Kay-Shuttleworth, Dennis Lange, Werner Frei, Greg and Cheryl Devine, Charles Smith. Guest Appearences: Liz Bazin, Andre Knoetze, Sineke Schmidt, Ariadne van Zandbergen, Hanlie Steyn. This meet followed a similar pattern to the meet of 28-30 Oct 2016. The group met in Willowmore at roughly 3 pm on the Friday and drove in convoy onto the farm… and luckily we did. Although the minor wash-aways on the track to the farm were manageable by all the vehicles, the long wheelbase of the Jones’ converted ambulance was enough to get it grounded like a see-saw on a drainage hump. After some minor road adjustments we were on our way again and reached the farmhouse with no further incident. 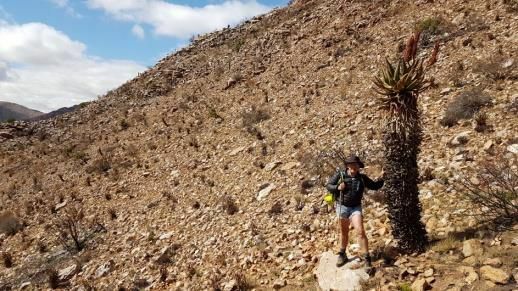 Saturday saw the main party of 14 set off for the high ridge of the Witteberge, while Greg and Cheryl went on a climbing expedition to test some of the clean slabs to be found in the valley and Nicky went in search of post-fire fynbos growth. The main party set off up the gorge behind the farmhouse just after 8 am. 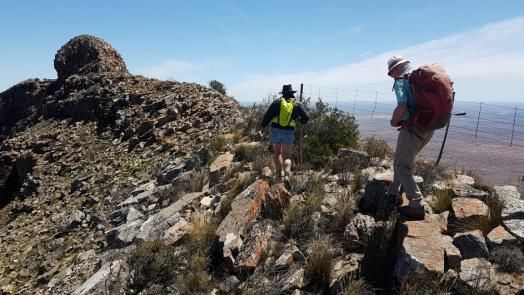 At the first rock scramble, Dave and Fay felt it was prudent for them to turn around and explore some of the flatter walks in the area and so it was that our party continued as 12 all the way to the summit. 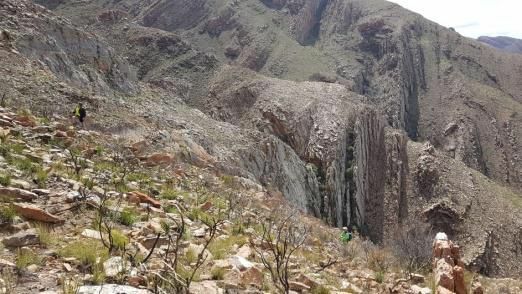 After roughly 40 minutes we reached a dry waterfall, which until recently was a natural dead end for anyone exploring that particular kloof. 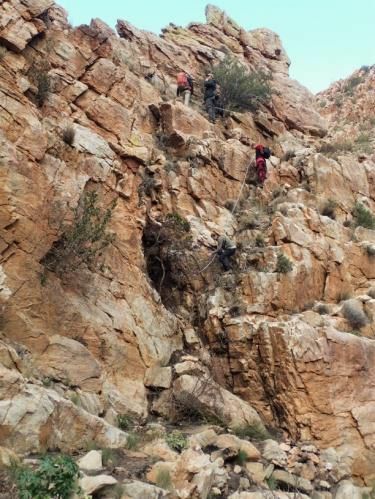 However, up the slope to the right of the waterfall there is now a well-placed bolted chain traverse which makes it much easier to access the upper reaches of the catchment area. Only one member of the party made use of the chest harness with cowtails attached to the chain (useful piece of safety equipment on that route), while the rest of the party felt safe enough to continue as is. Once passed the chains we headed up the slope to the west and onto the saddle for a tea break. Cloudy skies and a cool breeze kept the temperature just right and we were thankful we weren’t in one of the heatwaves that can start forming in the area at this time of year (the following week temperatures rose to the high 30s). 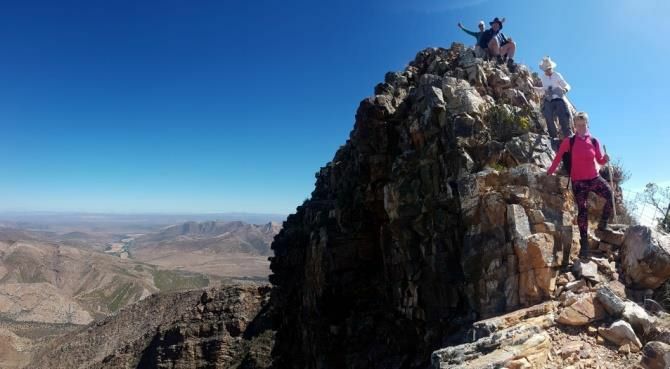 After tea the party continued up the ridge and by 10.30 am we were looking across the Great Karoo, watching whirlwinds kick up spinning towers in the sea of dust between us and the mountainous islands near Graaff- Reinet. Interestingly, the addition of the chain traverse (and the lack of any serious vegetation due to a recent fire) saved at least an hour from the route that we had used 2 years prior. Having reached the ridgeline earlier than expected, we enjoyed a second tea, before deciding to follow the ridge to an alluring rounded peak to our west. What a lovely walk that was. 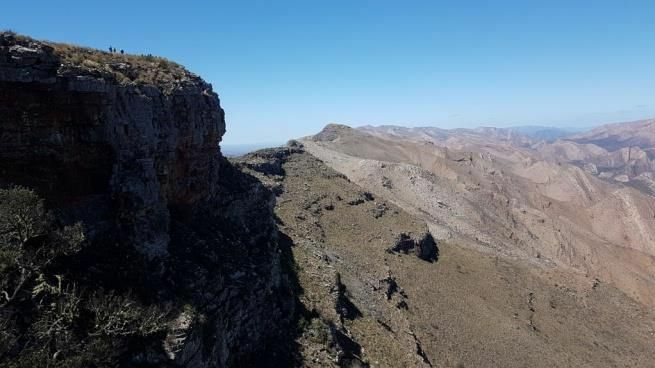 At some points the ridge became fairly narrow with steep drops on either side and there was even a precarious rock scramble just before the final summit (which we reached around 12.30). At roughly 1400 m the summit offered magnificent 360 deg views and made an ideal lunch stop. After lunch the knee jarring descent began. 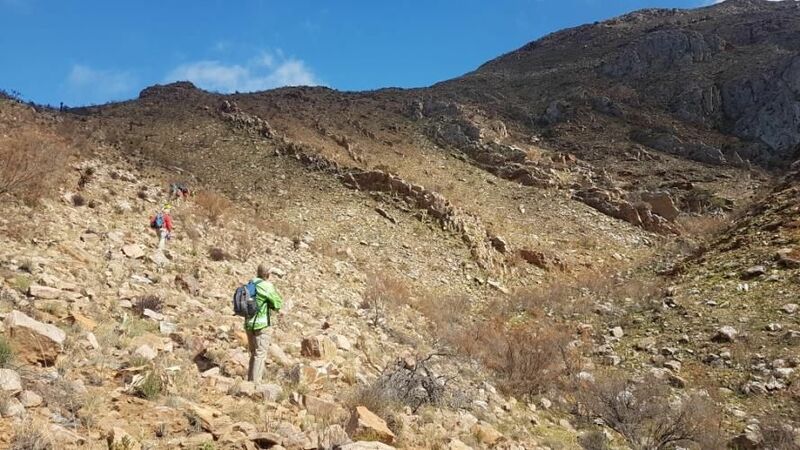 We skirted around the upper slopes of the catchment area 2 kloofs west of the farmhouse with the idea of dropping onto the ridge west of the one we had used to ascend; however it became evident going straight down into the kloof would be easiest. From the summit back to the Farmhouse took between 3 and 4 hours. 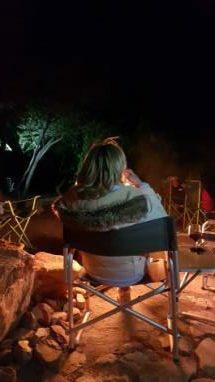 Some weary souls sat around the fire that night. The following day dawned bright and breezy. While some of the party headed for home, a small group explored the valley floor to the east of the farmhouse. 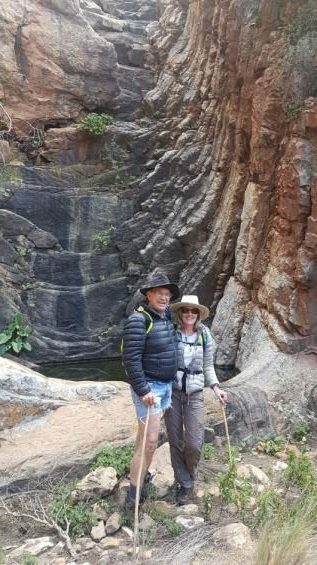 We didn’t succeed in finding any new rock art sites (which was part of the reason for the walk), but we had a lovely walk through one of the kloofs cut by the main river course. 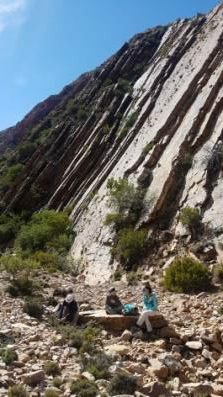 We stopped for tea under some amazing slabs which look fantastic for a future climbing meet. After returning to the farmhouse in the late morning, we packed up and left for home, with one small group making a quick detour to some recently discovered rock art on the edge of the farm.